Note: Black Friday and other holiday sales are coming up - this is a good time to use those craft store coupons for savings on slightly more expensive products like heat tools, custom stamping accessories, etching paste (from yesterday's etching tutorial), etc. 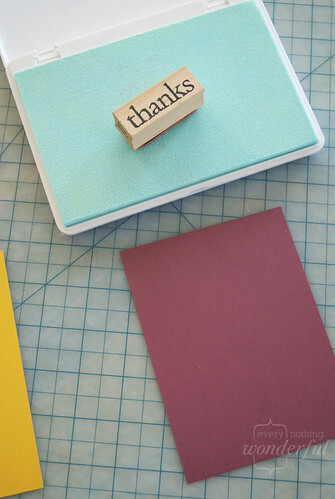 There's no limit to what you can heat emboss with the right stamp and a little thought. A few fabulous gift ideas: recipe cards, book plates, custom gift bags or tags, calling cards, monogrammed stationery, invitations, menus, holiday cards, journal/album/scrapbook covers (careful that it's a paper cover though, not plastic or something that may melt), photo/art frame mats, calendars/date books, labels, boxes, file folders, magazine holders...need I go on? Stamp Ink - you can use plain ink, or the ink specifically for embossing, which dries more slowly and comes in a faint tint or clear color. Decide what you would like to stamp and where. 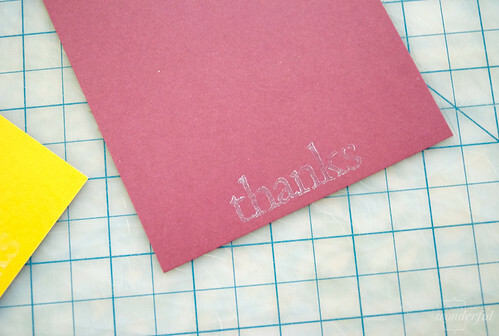 I decided to do thank you notes - the "thanks" stamp is from PaperSource (and a happy leftover from our wedding, hurrah!). Stamp your design on your paper. 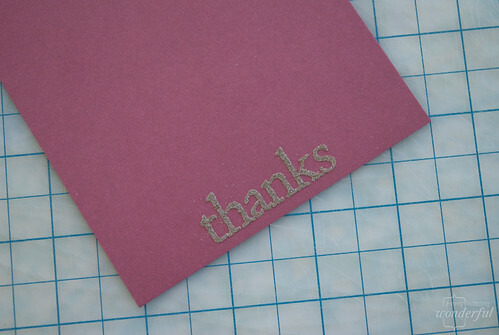 The above shows what a tinted embossing ink looks like stamped on a note card. 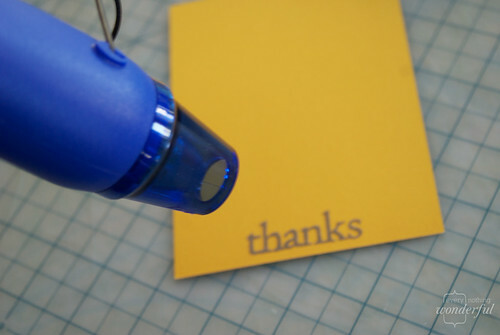 On a lined surface (I use a cookie sheet and wax paper), dust the embossing powder over the stamp. You'll want to make sure the surface is lined so that you can reuse the excess powder, or put it back in the vial for later use! 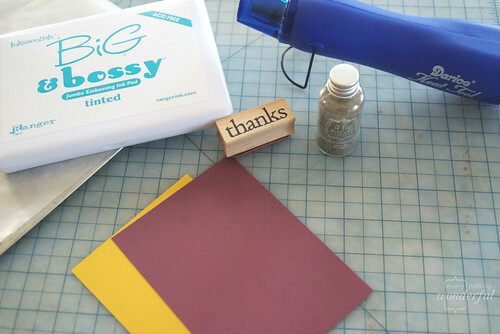 Shake, tap, and dust off the excess embossing powder. Get off as much excess as possible - once you emboss the design (and any dusty extra bits) you can't get it off - so be sure everything looks like you want before continuing on. Turn on your heat tool and heat the area of be embossed with back and forth strokes. 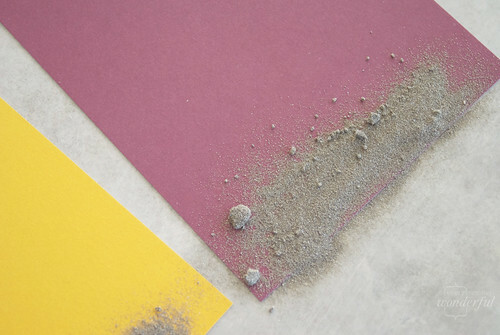 You'll soon see the embossing powder turn from dusty resin to a melty pebbly texture. Heat just a bit longer (as in a few seconds) until the embossed section becomes a smooth, raised metallic surface. Let cool. Make sure to read and follow the instructions on your particular heat tool and be sure not to leave on one section of the paper too long (as it might catch fire), or leave running at any time. Turn off your heat tool as soon as you are done using it. You may be tempted to stop using the heat tool when the embossing powder turns to a pebbly texture like this - let it go just a bit longer and you'll get a more smooth and finished surface. 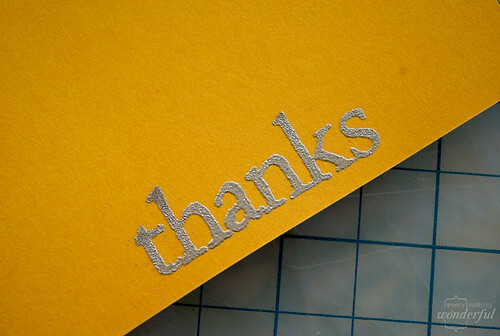 Your paper may bend or warp a bit when embossing. 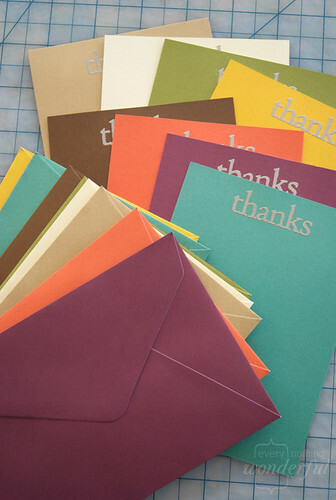 Just place under a heavy book for a bit of time and you'll get nice flat note cards in no time. 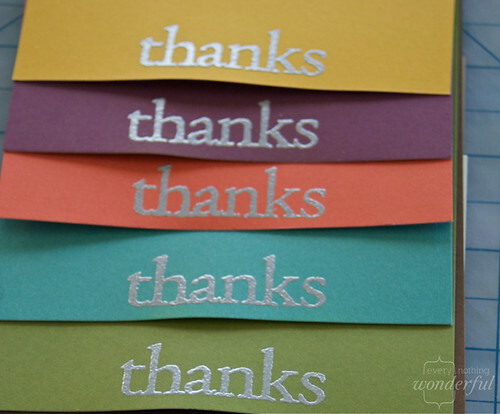 Giveaway: I have two sets (8 cards) of the "thanks" note cards shown above to give away. If you would like one go ahead and comment and I'll pick two people at random on Monday, November 29th. These are great! I've always wanted to know how this works. Question: does the heating tool have to be a sanctioned embossing tool? can you use a blow dryer or is that just... ghetto...? Well, unless you've still go your Conair from 1970 that is all heat and no actual force when blowing the air, probably not. You could try, of course, but I know my hairdryer would just blow the embossing powder right off the page. Some people get pretty darn ghetto with their embossing - read: toaster, stove, etc and if you don't mind an extra trip try it with your hair dryer first. If it doesn't work, head back to the store!